Stuffing is so much easier than wrapping. And when it comes to pork tenderloin, I have a go-to method that always brings rave reviews. It involves dried fruit that thickens and sweetens with roasting, and a little love from the skillet before being tossed into the oven. Simple. This is a similar method, because you stuff the loin with sage rather than bothering about halving it, wrapping it, and tying it, all needless effort in the end. Although on second thought, there is some wrapping involved, but it's of the prosciutto variety, and is as much effort as an afterthought. Besides, this time of year, you might be all wrapped out. Anyway, a stuffed tenderloin is much like a gift, with that little something special hiding inside, flavoring the meat on the sly. The recipe, from Fran Warde's Food for Friends, is meant to serve 8 and calls for 2 pork tenderloins. In this apartment, we only have two, so I halved the amount of meat. I did, however, make the original amount of lentils. 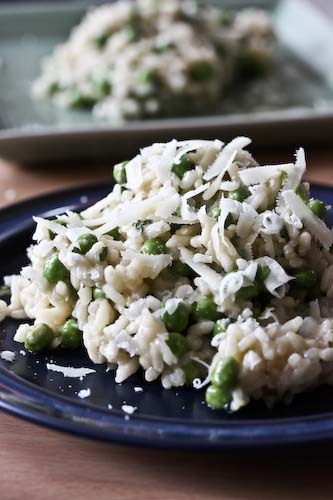 The recipe, once the dressing is tossed with the lentils and red peppers, produces a delectable salad, just as good chilled as at room temperature, which I find provides a perfect light lunch after a more involved (but not too involved) dinner. The recipe calls for brown lentils, but I used the French green lentils I had in the pantry. They take a bit longer to cook, but not much, and they maintain more of their firmness. Below, you'll find the recipe as I made it. 1 pork tenderloin, about 14 oz. Trim the fat and the silver skin from your tenderloin. Slice the tenderloin in half horizontally in the middle. With a paring knife, pierce each tenderloin lengthwise through the middle, then rotate the knife 90 degrees and pierce again, making an x. Insert the handle of a wooden spoon into the slit and roll it around a little, opening up the pocket you've just made. Into this pocket, stuff the sage. Do this on each piece of tenderloin. Season the tenderloin with salt and pepper, then wrap in the prosciutto slices, which will stick all on their own. In an oiled roasted pan, place the tenderloin and cook for 35 minutes. Allow to rest for 5 minutes before cutting in. In the meantime, prepare the lentils. Cook the lentils in simmering water for about 30 minutes (they'll maintain some of their bite), then drain. In a bowl, mix the scallions, oil, wine and sour cream. Add the bell peppers to the lentils. Serve with the tenderloin plated on top of the lentils, a bit of scallion dressing spooned over the top, and a generous sprinkling of chives. 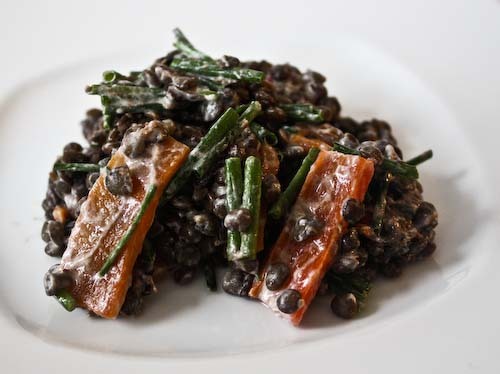 Alternately, you could mix the scallion dressing in with the lentils, which is what I suggest doing with any leftovers. Enjoy! if anyone is interested in making a standing roast. love the lentil salad w/ this. a perfect contrast to the pork. I'm loving your new header! Yummy! 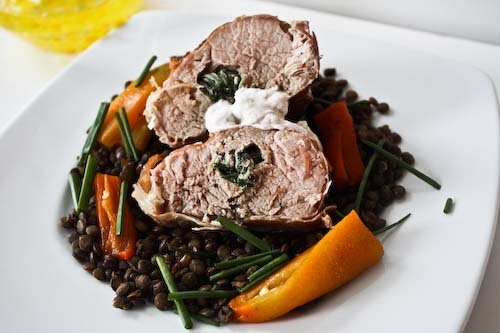 Lentils are one of my favourites, and BF will eat anything that is wrapped in proscuitto so this looks like the perfect recipe! And so easy too! 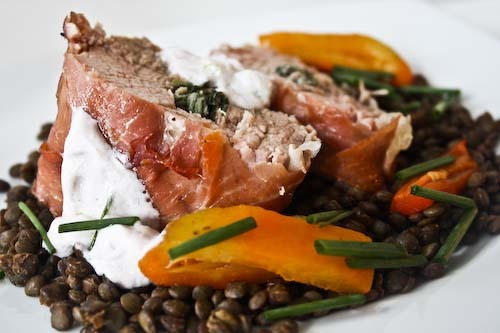 Pork and lentils are a match made in heaven. This dish looks delicious! It sounds really tasty and looks impressive too! We are Never Full - you're right, that is one impressive piece of meat. I'm going to take your advice and find a butcher! Wanderers' Daughter, ha ha, the Gug also makes me dizzy! Miss Marie, thanks so much! I love your new site as well! Annie, aren't boys funny like that? R loves meat wrapped in meat as well. Thanks Amy! I'm a lentil lover myself. I just made this for an impromptu dinner party and everyone loved it! It turned out wonderfully. about to go start cooking this for our party tonight RIGHT NOW :P wish me luck!